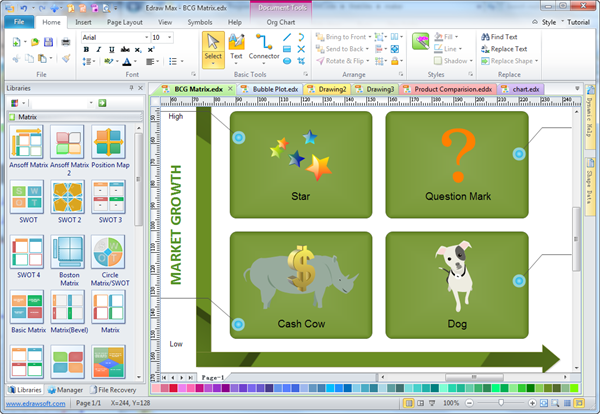 An easy bcg matrix maker that helps make bcg matrix and charts with free templates. Quickly and easily create bcg matrix and many other diagram types in minutes. Discover why Edraw is an awesome BCG Matrix maker: Download it Now. Edraw BCG Matrix maker is used to help visually represent business products' priorities portfolio of your company's products and decide which product will do best depending on the product positioning. It's widely used in brand marketing, product and strategic management and portfolio analysis. The four quadrants in the Matrix represent four kinds of business units respectively, which is illustrated below. Cash Cow - A mature unit which has a large market share, growing slowly. It needs little investment but generates cash which can be used in other units. Star - A unit with large market share, growing fast, requires investment to maintain its lead. A star may become a cash cow when it becomes mature if managed successfully. Question Marks - This unit has low market share compared with competitors, but it is doing business in high-growth market. It is also called Problem Child vividly. This market is growing with opportunities as well as risk involved with investing, so these businesses are called question marks. Question Marks require continuous investment and improvement for their development and growth. Dog - This is a business unit with small market in a mature industry. It needs not substantial cash investment but straps capital which could be invested in other units. If there is no other strategic purpose, it has to be liquidated when there is little hope to gain market share from it. The Edraw Boston Matrix maker can build a framework for easy comparison of different business units at a glance. It requires no learning curve while provides out-of-the-box tools. No prior knowledge and artistic skill are demanded while comfort and enjoyment are offered. Edraw is a simple BCG Matrix maker with cutting-edge tools producing trump matrices. For those who have already accustomed with other Microsoft apps such as Word or Excel, the interface will be very familiar. Simply drag and drop symbols, apply built-in designed themes, and share your finished BCG Matrix into a presentation or PDF with one click automatically. 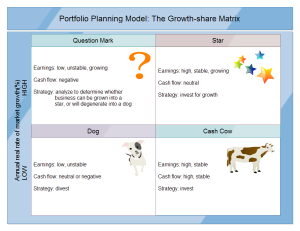 A portfolio planning model template is predrawn. As soon as you open it, you can use it to make infographic portfolio planning as easily as it can be.